Πατήστε τη φωτογραφία και δείτε όλες τις φωτογραφίες του Moment de VIE. 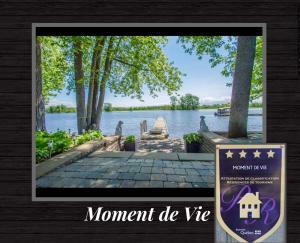 Set near St. Pierre Lake, Moment de VIE is a quiet chalet located on the river. A BBQ is provided on site. The property is 47 km from Trois-Rivières. The kitchen is equipped with a dishwasher, oven, coffee machine and kettle. A flat-screen TV and DVD player, as well as a laptop are offered. There is a private bathroom with a spacious shower. Saint-Alexis-des-Monts is 39 km from Moment de VIE, while Saint-Denis-sur-Richelieu is 37 km away. You can engage in various activities, such as cycling, fishing and canoeing. The nearest airport is Montreal-Pierre Elliott Trudeau International Airport, 90 km from the property. Please note, guests must have a provincial fishing license for St. Pierre Lake. Please inform Moment de VIE in advance of your expected arrival time. You can use the Special Requests box when booking, or contact the property directly with the contact details provided in your confirmation.